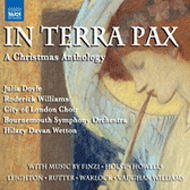 In Terra Pax: a Christmas Anthology is a collection of pieces that are found slightly off the well-trodden path, and yet feel as familiar as Christmas itself. This recording has been widely praised (see reviews below) and reached no. 2 in the Gramophone classical chart.